To sustain your meritocratic fortitude you need to bring forth your inner glow, a glow only you could see, feel and touch. It is a glow that needs to be rekindled if faint and a glow that needs to twinkle if tarnished. You have tried, we all know that you have but the world is changing and if you do not change you shall be held back like so many others that cannot find their way forward. Sustainment ensures constant endurance and tolerance even when the tide is out. You are indeed very, very special but when changes happen you suddenly forget your importance in life. This article is dedicated to you for your presence on planet Earth, for your endeavours since we first met and for your courage from the beginning of your realisation. To ensure sustainment you need to glow like ember. Ember is created from glowing hot coal and remains hot even when the fire has gone out. Ember has a spark to it. Ember radiate a substantial amount of heat and gives of an aura of an amber glaze that lights up the sky at night and sends signals to others of warmth and glory. You need to be like ember. Your goals must glow all through the night and can be seen even in broad daylight. Your goals like ember must radiate a sense of warmth for yourself and to others setting of a golden essence of radiance that emits signals of authenticity and receives signals of wisdom and acknowledgement. This is the glow that I want you to have at all times. I want you to feel it in the morning, during the day and at night. I want you keep a piece of sometime with you like a piece of paraphernalia that reminds you of your goals. Hold on tight to this every moment you can and as you hold it think of your golden goals. Think about what you have already done and about the things you will want to do. When I went to Brighton recently I picked up a shining pebble along the seashore which I keep in my pocket at all times. I hold onto it, I talk to it and I use it to remind me of my responsibilities and my presence on planet earth. I keep it as an emblem of courage and fortitude or ornamental charm in my pocket to acknowledge that I have a purpose in life and using my golden goals I can make life more interesting than ever for me as well for others. I am indeed the captain of my golden goals. I am responsible for my goals and from these goals cometh my future. I must change or modify my goals as my course or charter changes. If I cannot sail through the Suez Canal to travel to say India I need to redirect my vessel on a new course perhaps longer but surer. As the Captain of my Golden Goals I must keep my craft of intent in good order from stern to bow or from head to toe, from hull to sail or from skull to tail. I am going to make the final months of 2014 the best months of my life because I know that I am indeed special. This is the motto that you should print off and keep in your wallet. This is a memento of your true value in life and your significance to your overall contribution to life. You need to have the Midas touch to remind yourself that your goals are really golden goals and that everything you touch shall turn into gold. A signature on a dotted line can change sand dust to goal dust. 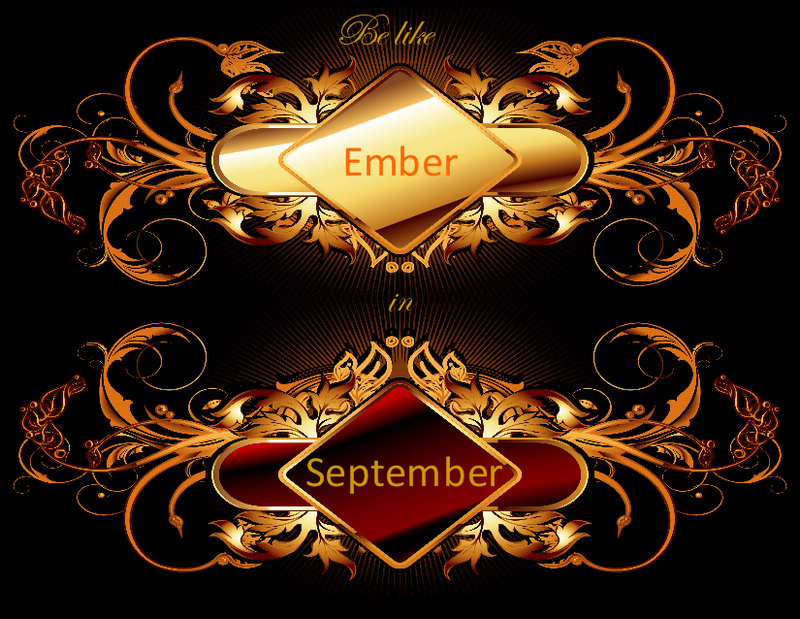 This is the spirit of ember in September that I want you to have and it is the ember in September that I certainly will want to have. Have a great month and a great future but don’t hold opulence in your hands to keep for yourself but be generous and share it, because there is enough for all.